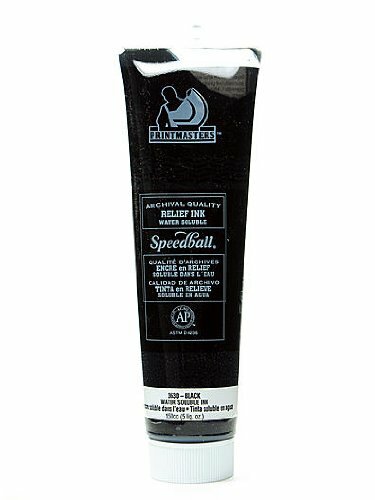 Speedball Printmaster Relief Ink & Mediums black 5 oz. Designed for the printmaker, these vibrant, highly pigmented true-process colors allow you to achieve an unlimited color spectrum. Printmasters Relief Inks have a similar viscosity to oil-based inks. These high-quality colors are compatible with all Speedball water-based block printing inks. They are AP non-toxic, and because they are water-soluble, Printmasters Relief Inks are simple to clean up with just water.Available in 5-ounce tubes.Printmaster inks can be used in combination with Speedball Extender base to create vibrant transparent layers for producing extended color ranges. Speedball Retarder slows drying time and is useful in low humidity areas.